Anchored along the boulevard at Marina Bay Sands, this casual waterfront bistro takes its name from the Australian coastline. 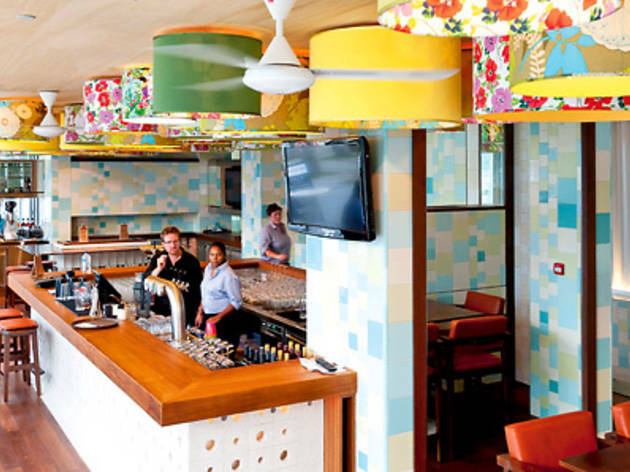 Opened by the former owners of Robertson Quay’s Boomarang and helmed by Aussie chef Timothy Maudson, South Coast dishes up surf ’n’ turf, burgers, pizzas and salads to an eclectic bunch of twentysomethings, the business crowd and ladies out on the town. It’s just too bad its menu never quite lives up to the magnificent views across Marina Bay. On the night we visited, the sun had not yet set but already, the bayside outpost was buzzing. 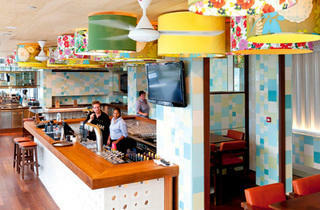 With its blue pastel-tiled walls, furniture bathed in warm shades of brown, and red, yellow and green floral-patterned lampshades, the decor helps engender an atmosphere that’s at once laidback and jovial, but the view was not as panoramic as we had hoped: the restaurant is wedged between the crystalline façade of the forthcoming Louis Vuitton concept ‘island’ store and a cluster of palm trees that obscure the view of the CBD lights across the bay. The night was clear, with a lick of a breeze to keep us from melting, but on being led to our alfresco posse, we discovered we had been seated in the smoking section (yes, they do still exist). Upon enquiring, we learnt that this is the only area for outdoor dining; the alternative eating space is at the bar. Sadly, no mention of this had been made upon booking. Deciding to bear with it, we ordered the mixed meat sharing platter ($45). Recommended for two, it can easily feed three: consisting of four meats and two mini pies, served on a block shaped like a surfboard, it’s kitschy yet cute. While the pies had a noteworthy crispy crust, the pork and kangaroo fillings were scarce and lacked gravy, a culinary heresy for Australian meat pies. The platter’s saving grace was found in the fragrant lamb cutlets and generous slices of tender Wagyu beef paired with a rich red-wine jus. Craving more beef, I ordered the Coast Wagyu Burger ($27) for mains. One friend ordered the battered barramundi and chips ($26), while another picked the intriguingly named Coops Burger 85290454204 ($27). The maître d’ explained that the name refers to the phone number of the burger’s creator, a man surnamed Cooper who lives in Hong Kong. ‘Complain to him if it’s bad,’ he joked. Tucked between soft Turkish pidé bread, the Coast Wagyu’s hefty beef patty was flame-licked on the outside, but juicy pink within. The caramelised onions, sweet pickles and tart slices of beetroot (a staple in Antipodeanstyle burgers) inked in their flavours with each bite. The crispy bacon (an additional $2) rounded out the meal. The Coops Burger, paired with slices of pan-fried fromage du jour halloumi, lettuce and bread smeared with a fresh minty tzatziki, was not as digestible. Although lamb is usually served medium rare, this fillet was almost raw in the middle and cold. Sensing my friend’s dismay, the waiter promptly whisked it away and returned with the burger reassembled, and its meat cooked through. At nearly $30, the barramundi (aka Asian seabass) was not a memorable dish. The two white fillets – encased in crispy batter made from Victoria Bitter ale – weren’t bad, but they weren’t great either; at least, not at that price. There was no distinct flavour and even a squirt of lemon added little zest. The chips tasted insipid and the tartare sauce had a plastic tang, even though they assured us it was home-made. South Coast is a decent establishment with a varied menu and wine list. Staff are friendly and the relaxed outdoor atmosphere is a welcome alternative to the highbrow restaurants nearby, but don’t count on it being a cheap night out. When he sensed our discontent with the lamb burger, the maître d’ prevented a ‘Coops de grâce’ by sending to the table free crème brûlée; yet strangely, he charged us for the scoop of vanilla ice cream that came with it. In case you’re wondering, Cooper’s number went to voicemail when I called. Marc Checkley.